A lot has been written about Fille Saint Merced Cainglet—news articles, player profiles, fan blogs—none of which has really spoken the words bursting out of my chest. And so to this unacceptable hole in sport literature, I eagerly offer this latest issue of DNBG with the aim of sufficiently chronicling all angles of this crazy phenomenon that has seen non-sporty guys like me suddenly tuning in to watch a sport we thought had died ages ago. Let me be the voice of the voiceless falling for a volleyball player who can only play with us in our wildest dreams. To Fille, I offer you my love letter. You don’t know me but you should. I’m one among thousands who fell in love with you because one of our pals told us to “Check out this Fille Cainglet” one fateful day. And so I tuned in, spaced out, fell deep, and now I can’t get over you. Like a ball that never goes over the net and hopelessly hits it every single time. I credit you for my knowledge of volleyball, much of which was only recently gained by never failing to watch you play in the UAAP. I swear to you I forgot a long time ago that volleyball is a game with four or five sets where teams race to 25 points each set except for the last one. Did I get that right? The rules are still fuzzy to me but believe me when I tell you that if not for ogling you on the court, I would’ve died never remembering what the sport was all about. Such a terrible shame of existence you saved me from, my messiah in short shorts! But what amazes me most is I keep on watching volleyball without really caring about volleyball. Oh, I wish I do, but I really don’t! It does seem like a fun, healthy sport and yadda, yadda, yadda—but the point is I only want to watch you. At times, it even feels like you could’ve been washing dishes and I still would’ve sat down popcorn and all on the couch, gripped by the tale of how tiny soap bubbles pop in your dainty hands on the TV screen. I guess it’s your oriental eyes that make you look like a seductive ninja assassin in the Edo Era. Or that permanent smile you wear even during the most crucial moments of the game and the hardest of falls. In truth, a sudden desire to be a wooden floor erupts in my heart whenever you fall, Fille, so I could catch you and tell you the pain will soon go away. But then you never looked like you felt any of these falls, anyway. In fact, you always look as if you just gave birth to baby unicorns sliding on rainbows and playing violins with their horns. Even your sweat doesn’t make you look icky-sticky unlike the average, normal human being. Whenever I step out of the MRT every morning, I’m sweaty-icky-sticky. Sweaty-icky-sticky-stay-away-from-me-stinky, actually. You never look like that. On the contrary, it’s mind-boggling how your sweat makes you look fresher. You’re like the infamous McDonald’s fries–you’re incapable of spoiling. Are you somehow related to Benjamin Button? Were you born into this world an old woman and now you can only get younger and fresher ’til the day you die? But maybe you can’t even die. What if you’re like a phoenix, reborn in fire? Or perhaps a phoenix-like eagle eternally renewing her life through scorching blue flames? Your grace on the court is otherworldly. It’s like Rachmaninoff’s “Rhapsody on a Theme of Paganini” directly translated into muscle movement. Somebody told me you once did ballet and fencing and that’s the reason why you easily flow on the court like a song. I wouldn’t be surprised if you did a combination of the two–ballet-sword-fighting while juggling the cosmos and hearts of lonely boys. I can’t emphasize enough how I could care less about your player stats and feats even though they’re obviously astonishing and I’m sure you’re mighty proud of them. Whenever my pals and I watch the Lady Eagles play, the only insight I can give is “God she’s lovely as the summer sun” and I tend to do my game analysis in a strange language of smitten sighs and “tsk-tsk-tsks.” People may say I’m not a true volleyball fan but I dare them to say to my face that I’m not a true lover. You and I together. You and I exploring our schools hand in hand. We’re like neighbors, you know? You can show me around Ateneo and I’ll take a silent stroll with you around UP while exchanging sweet glances and eating isaw. You and I painting everything blue. I’ll paint anything blue for you if that’s what it takes to make an Atenean like you happy—even our dogs and chickens at home. PETA can cry in outrage, I don’t care. You and I devouring everything green. Green, leafy vegetables—we’ll tear them to shreds with our fangs and spit them out onto the floor like psychotic, vegan savages. Or maybe I’ll serve you a whole ungutted sushi slathered in green wasabi, so you can eat the green’s heart out like an aswang–green, spicy sauce dripping from your irresistible lips. Vengeance has never been so healthy. You and I giggling, whispering about how Gretchen Ho, Mika Reyes, and Michele Gumabao are kinda pretty, too, but they pale in comparison next to you. Me, admitting I also liked Bea Tan’s moves on that “Call Me Maybe” video but, well, she’s just no Fille. Just no you. You and I falling… in love. Well, this letter is already too long even for an infatuated guy with so much to say. But if you’re reading this, I hope you can somehow feel a little bit of what I feel, Fille, and know that with me, you—the most beautiful of the blue—will never ever again have to feel lonely and blue even when La Salle beats the crap out of you. This is one of the sweetest love letters I have ever read. :D Thank you so much! This letter made me smile, laugh, and say awww. 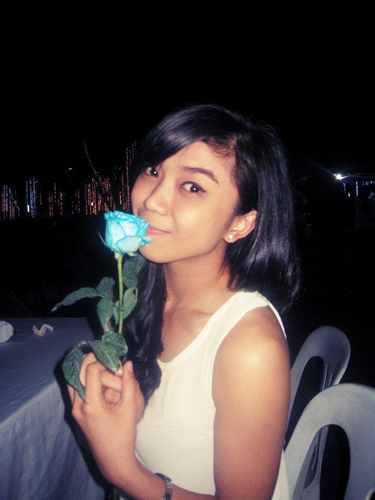 i am also a fan of FILLE CAINGLET……..